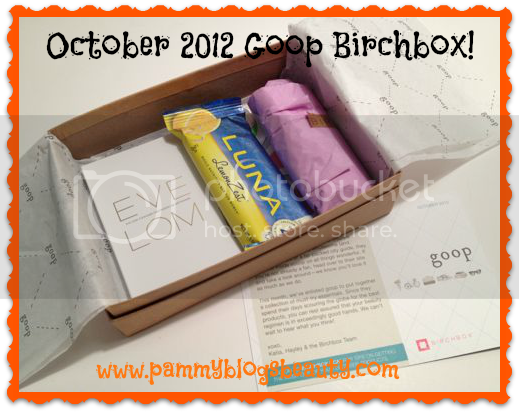 Pammy Blogs Beauty: October 2012 Goop Birchbox: Box Opening! October 2012 Goop Birchbox: Box Opening! It is Birchbox time again ya'll! Yes, it is time for another one of my monthly Birchbox box openings. Earlier this month, Birchbox sent out an email. Subscribers had the choice to either choose a regular October Birchbox or a special edition Goop Collaboration Birchbox. As much as I love the "regular" monthly boxes, I really can't resist an opportunity to get a special box! There seem to be so many monthly box subscriptions out there now. It can be a bit overwhelming to choose! I have tried quite a few, weeded some out, and am happy with my small handful of monthly box subscriptions. So, I only subscribe now to the monthly box programs that I truely love: Birchbox, Julep, and GLOSSYBOX. Curious what has been in some of my previous Birchboxes? Be sure to check out these posts: Birchbox Introduction Post, Jan 2011 Birchbox, Feb 2011 Birchbox, March 2011 Birchbox, April 2011 Birchbox, May 2011 Birchbox, June 2011 Birchbox, July 2011 Birchbox, August 2011 Birchbox, Sept 2011 Birchbox, Oct 2011 Birchbox, Nov 2011 Birchbox, December 2011 Birchbox, January 2012 Birchbox, February 2012 Birchbox, and the March 2012 Teen Vogue Birchbox, April 2012 Birchbox Box Opening, May 2012 Gossip Girl Birchbox Box opening, June 2012 Birchbox, July 2012 Birchbox, August 2012 Back to School Birchbox, and the September 2012 Birchbox. So, what is inside this GOOP Birchbox? Keep reading to find out! This month's box is full of Goop's picks for "Must Try Essentials". Chantecaille | Faux Cils Mascara: (sample size: .14 oz, full sized cost $42.00): I always love a good mascara sample. I am a drugstore mascara girl. So, getting a high-end mascara is a total treat! Chantecaille is a brand that I have always wondered about but never tried. So, I am excited to get this sample mascara! Meet your wand love - this water resistant mascara delivers exceptional volume, length, and curl. DDF | Wrinkle Resist Plus Pore Minimizer: (sample size: .23 oz, full sized cost $85.00): Okay, I might have to adjust my age-settings in my Birchbox profile. With my "advanced" age (late 30s), I seem to be getting the anti-wrinkle samples lately. While I appreciate a good anti-aging product, my focus is still more on finding "fun" products rather than battling the age process. I really don't have wrinkles yet and just have a few fine lines. However, since I am all about prevention, I know that I will use this product. Plus, my pores are huge and they need all the help they can get as far as minimization. So, I am curious to try this! This high-tech moisturizing serum fills in pores and wrinkles for instantly smoother skin, while peptides and vitamins provide long-term anti-aging benefits. Eve Lom | Cleanser and Muslin Cloth: (sample size: foil sample packet with one muslin cloth, full size $22-$50): While I wish this sample was bigger, I still am curious about the product. A foil sample is just not quite enough product for me to do a good testing as far as skincare. Anyways, Even Lom is certainly a brand that I am interested to try! I have heard about it for years. So, this sample is my first intro into the brand. I guess the idea here is that you get some gentle exfoliation from washing with this muslin cloth? Unique idea! The balm-like cleanser gently purifies and tones skin, while the matching finely woven cloth exfoliates without causing irritation. per-fekt Beauty | Lip Perfection Gel (sample size: tiny foil blister pack, full sized cost: $24.00): I am a huge fan of per-fekt beauty. So, I am thrilled to get a sample from them! Awhile back I reviewed their Eye Perfection Gel which I really liked! While I really wish that this sample was larger, it certainly will give you an idea of how the product will look and feel. My lips are constantly dry. So, I am always looking for lip products that provide both color and moisture. Part tinted gloss and part moisturizing lip treatment, this multitasker has you covered on all fronts. Lifestyle Extra: Luna Lemon Zest: (sample size: one bar, full size cost: Pack of 15 $18.75): I love Luna bars and buy them all the time! So, I am always happy to get one in a Birchbox (since I only buy them when they are on sale). If you have never tried Luna bars, then you should certainly scope them out next time you are at the grocery store or next time you place a Birchbox order. They really taste like desserts. Go ahead and toss out your notions that healthy bars taste like cardboard, these are delicious! I am all about getting a food item as my "lifestyle extra" in my Birchbox. This month's box had a couple nice deluxe samples and some small foil-package type samples. The Lifestyle Extra Luna bar is a nice treat too. So, I am very happy with this month's box. The Chantecaille Mascara makes the box for me! I love getting a high end makeup treat! My fellow Birchboxers, did you like your box this month? Did you go for the Goop Collaboration box? If you did, was it the same exact box that I got? I am curious to find out if all the Goop boxes were the same? I pay for my own Birchbox Subscription. I received a Goop box as well, but my contents were different. I got a Jouer lip enhancer, a Kiehl's eye cream, a candle, sunscreen serum by Supergoop, and a Luna bar. I'm pleased with this month, but agree that getting a Goop box wasn't much different than a regular monthly box. I cancelled my BirchBox subscription the other day since all three of the boxes I received from them were no good. I though it was supposed to be all about beauty but I guess not. I could only use like 3 or 4 of the 18 items I received. I am sticking with Ipsy (Formerly MyGlam). I have used everything from all three Glam bags I have received, including the bags that the products come in. @sarahkeh82-Oh well! Sorry it didn't work out for you. I am the opposite. I love Birchbox; but, I cancelled MyGlam/IPSY as I was not happy with the Glam Bags. @LuluBelle-Oooh! Your box sounds good! I would have loved to get a Kiehl's eye cream! I also just received my Goop by Birchbox box today. I received everything you did, except the per-fekt Beauty Lip Perfection Gel. I got an Amika nourshing hair mask sample instead. A generous one at that!! It's actually enough for my hair (most foil samples aren't even close). @Brooke-The hair mask sounds very nice! :) Glad you liked your box too! I got almost the same box as you, but (as another commenter had) there was a hair mask instead of the lip gloss - which was totally awesome because I just ran out of hair mask. It was a packed, but very generous sized (probably 3-4 uses). I didn't opt for either box so I was quite surprised that I got a goop box instead of a regular box. @Ricki-Oh cool! Glad you got a few uses out of the hair mask sample. Interesting that you got a Goop box without selection the option. Glad you liked your box! Hi. Can anyone tell me how I can tell whether I received the goop box or the regular birchbox this month? @Anonymous-The outer packaging and tissue have "Goop" printed on it. Also, Goop will be mentioned in your product info card as well. Hope that helps!